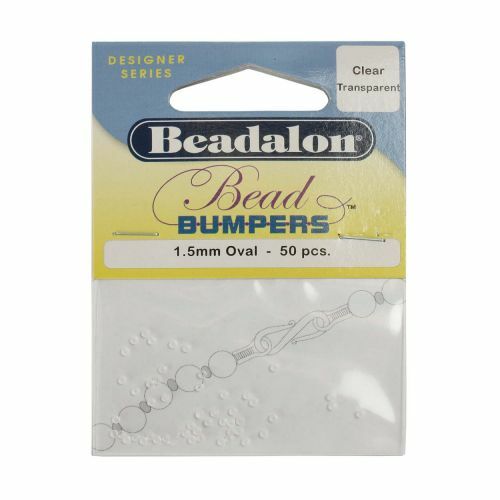 Use these new Beadalon Bead Bumpers instead of knots to separate beads and create an interesting effect. Just string one bead bumper between each bead in your design to space beads neatly and evenly. Bead bumpers will look similar to a knot and will stop beads from rubbing against one another. Clear bead bumpers let the colour of the beading material you're using shine through. As bead bumpers are made of a special stretch material, they can be used with wires up to 0.024" in diameter. Also great for use with memory wire to give a knotted look. Bead bumper measures 1.5mm. Sold per pack of 50. Picture is for illustration only. These bead bumpers are clear. CommentThey are easy to use and do the job. CommentLooks good. Completely new to me. Looking forward to trying it. CommentGood idea , but the devil to thread . CommentA nice product saves on notting time as the bumpers protect the beads. CommentHadn't seen these before - I'm sure I will use them a lot. CommentVery small, but it does state this, and excellent for protection of delicate beads. CommentLook neater than knots, easy and quick to use. CommentEasy to use and space beads nicely. First time I purchased these but would use again. CommentThought they'd be bigger.. look forward to trying them out..